An only child for my first 13 years, the abundance of cousins in my extended family filled my childhood with “almost” siblings close to my age. I am so happy that my mother-in-law Helen Skupien, also known as Grandma Sugar, is helping our second generation of Skupien cousins develop the same close childhood relationships that I treasured. Those relationships were in evidence at the annual Christmas-season gathering at Grandma Sugar’s home in Biloxi, MS. The celebration was filled with the cousins’ energy, excitement and enthusiasm. The photo below by our son Jeremy captures their shared intensity as five-year-old Ashton, left, opens an old-fashioned game of Twister. 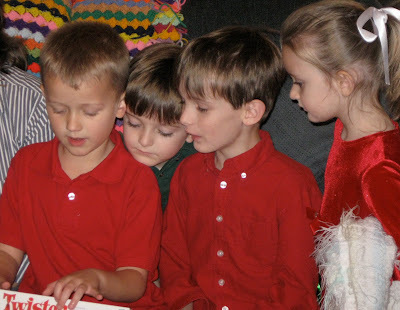 Providing an audience are Skupien siblings Nate, five; Luke, seven; and Charlie, three. 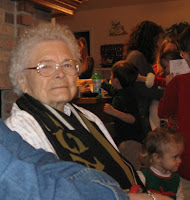 Grandma Sugar’s brood of Skupien cousins includes six grown grandchildren and eight great-grandchildren. 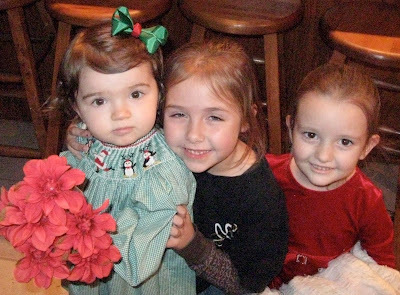 Below, from the left, girl cousins Molly Kate, 21 months old, Trinity, six, and Charlie, three, show off their well-practiced ability to pose for group photos. 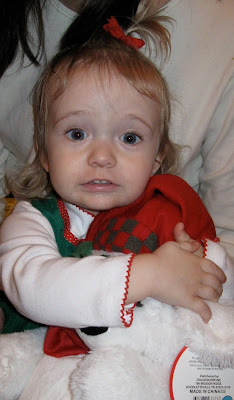 Molly Kate had fallen in love with a spray of Grandma Sugar’s Christmas flowers and makes sure they are in camera range. 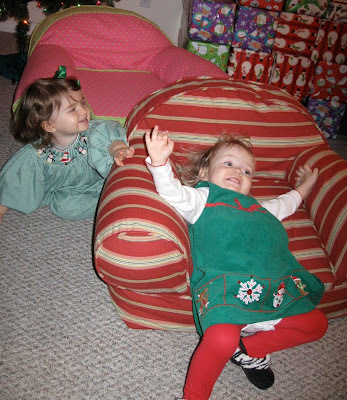 Below, the two youngest girls, Molly Kate and 19-month-old Stella try out their chairs created by Aunt Lila Skupien. Grandma Sugar is a super shopper. She has most of her Christmas shopping for the little ones done by the end of January but keeps adding to her stash throughout the year. And she makes sure she gets top value for what she spends. 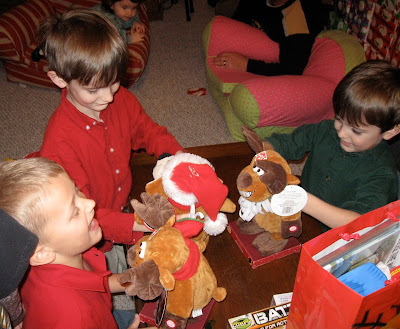 The dancing and singing Christmas critters below were a hit. And below, little Stella, long past her bedtime, immediately latched on to her new best friend, a Christmas bear Grandma Sugar gave her. Walter and I arrived home a little later than our sons and their families, and all five of our grandchildren were sound asleep, worn out from all-out partying -- and maybe with visions of sugarplums dancing in their heads. Goodbye 2009 and Happy New Year!